You may have heard this refrain from me before, but jeebus I really should read the books I pick for kids' book clubs thoroughly before assigning them. Last time it was kind of a lucky break, with Spud. I even started a fad among eleven to thirteen-year-old boys at the local elementary school for reading that series, and got some questions from parents but never any flack. I was lucky in this case too, or have been so far. Everyone I have talked to has been very understanding, and generally quite positive about the book in general. There were, unless I hear differently, no major disasters or even minor ones. This is not a bad book. It's pretty reasonable, actually; better, in some ways, than I expected, and it grew on me as a story though the writing is very workmanlike. But the age group that this book is recommended for, that I assigned it to for my parent-child book club, is by-and-large not entirely ready for the "Is Santa real?" discussion. In the past couple of days as I frantically tried to get in touch with the parents in the group to warn them, I was told that most of the kids in my group between the ages of seven to twelve are still believers. (The ones who weren't never were in the first place.) Ten or eleven is not too old to believe in Santa Claus. In the third chapter, one of the characters, six-year-old Susan, gets into a fight on the playground on the last day of school before Christmas break because one of the other children has told her that Santa isn't real. That was a kick to the gut, because I was Susan. At that age and at that time of year, and in a situation that was almost exactly what she experienced. Apparently I am still traumatized by that experience, as evinced by how abjectly horrified I was when I realized what I'd done after finally reading the entire book myself. I've been told I was really a fair bit more upset than the situation justified. Weird, isn't it, how some things stick with you long past the time when they really should? 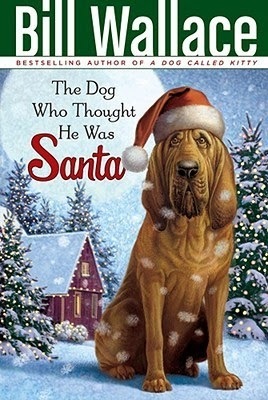 It is pretty clear throughout the book that Don, the main character (he is eleven or twelve and Susan's older brother), and Frank, the other main character (he's a dog) and the parents are not believers either. In fact, it's a very touching story about the family rallying around Susan, trying to figure out what she wants from Santa Claus and trying to figure out how to get it for her without tipping her off. In other words, they're trying to keep Susan believing, even just one more year. We, as readers, are privy to this, though it's never stated in so many words. The book ends very ambiguously: the existence of Santa Claus seems quite probable, in fact, given the ending of the book, which for kids who are already believers will be comforting and ring true. Though one of the believers in the group stated quite clearly that she was sure it was Frank who had saved the day, even if Frank himself quite clearly stated he had nothing to do with it. Aside from the grief it caused me this book is pretty charming. It starts out slow, but as I said above, it grew on me, because I liked the way the family really did stick together. Mom and Dad are present and accounted for, and supportive as Don and Susan are both starting to deal with their own particular issues. The writing, as above, is workmanlike; it does what it needs to without fanfare and occasionally errs on the side of clunky. But both narrators, Don and Frank, have their own special charm. Frank is surprisingly believable for a very anthropomorphized dog. I shouldn't have bought into his character, but I did. The challenge for me is who to recommend it to. Knowing what I know now, I would never recommend this book to a kid unless I knew for sure which side of the red-suited-man-line they are on. I would, however, recommend it to parents who are starting to have to answer those difficult questions. Either to read it to get a bit of perspective, or to help them think of how to answer, or to read aloud to gently open those lines of communication. Everyone who came to book club did end up really enjoying the book; we had no dissenters, which is somewhat unusual. Even the believers seem to have found what they needed in the book to confirm their belief, or are at least content to leave the questions lie for now. So, for the right kids, a pleasant, quiet, sweet, often funny Christmas story with a lot of heart and a lot of gentleness.